If you're having trouble making Lara jump in a particular direction, remember that the movement controls work relative to the camera, rather than to Lara's body, as in past games. So either jump in the direction you want Lara to move on screen, or try pointing the camera in the direction you want her to go and jumping forward. 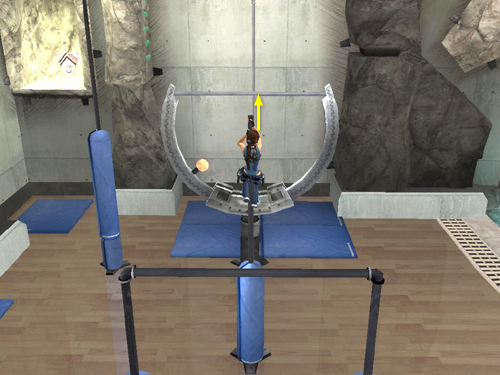 Example #1: Here, in order to jump from the vertical pole to the horizontal bar—i.e., toward the right side of the screen—you'd need to press Right + Jump. Example #2: Or, you could move the camera behind Lara by tapping the Center Camera button or moving the mouse or right analog stick. 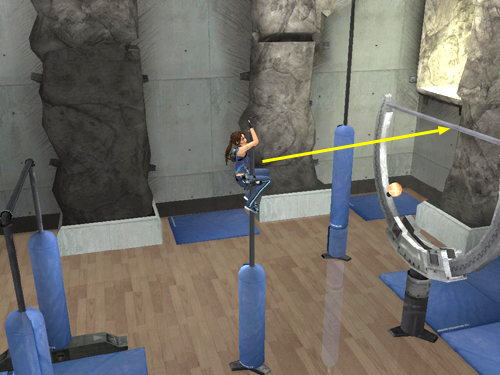 Once the camera is pointing toward the horizontal bar where you want her to go, press Forward + Jump. I find this method easier and more intuitive. 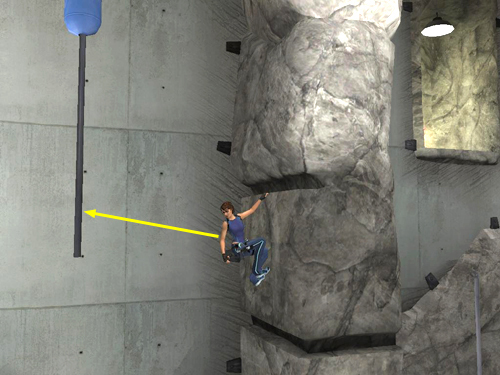 Example #3: When jumping backward from a ledge or handhold, it may not be possible to point the camera where you want Lara to land. Instead press the direction key or push on the left analog stick in the direction that makes her lean away from the wall. You'll see her posture change as she gets ready to leap. Keep holding the direction key or stick and then jump. The Legend Controls page includes more information on all the controls.